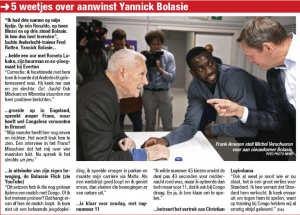 Signing Yannick Bolasie on transfer deadline day on a loan until the end of the season, Anderlecht pulled off a good piece of business. Fans of the Belgian club are already excited, having seen the player for 17 minutes in their 2-1 loss agains Standard Liège at the weekend, as they know the DR Congo international can be a game changer on his day. Despite being used quite considerably by Aston Villa during the first half of the season, the Everton loanee’s deal with the Championship side was cut short, which is when the Belgian club saw a last-minute opportunity to pull off a coup. Finally getting their man, the Jupiler Pro League side will now be able to count on his services as they try and redeem their rather poor season so far, and Fred Rutten, the club’s manager, couldn’t hide his happiness at the deal. While it’s quite obvious Rutten was joking, it shows how highly the Everton forward’s talent is regarded at his new club, and where the expectations are for the foreseeable future. For both the Toffees, who might try and sell him in the summer, and Anderlecht, the hope is that he meets them.